IMPERX, Inc., a leading global designer and manufacturer of high quality digital industrial cameras and imaging systems, is preparing to exhibit at SPIE Defense + Commercial Sensing (SPIE DCS) 2018 on April 17-19 at the Gaylord Palms Resort and Convention Center in Orlando, FL, Booth 1405. 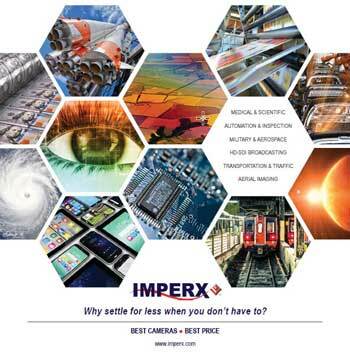 Among the many cameras being exhibited at the show, Imperx will also be debuting its BRAND NEW 2018 Product Brochure containing an extremely wide array of product offerings which have an endless number of applications. The brochure contains specifications and details for the NEW Tiger CCD line, an impressive new camera series which highly advances CCD performance and value. Like the Bobcat series of cameras, the Tiger series offers a variety of models, high quality digital images, flexibility, and dependability but with various improvements and ALL-NEW capabilities. Also included in the brochure is the dynamic Cheetah CMOS camera series, which provide customers with the quality, versatility, and rugged durability needed to meet their most complex and demanding requirements. The 2018 Imperx Product Brochure employs a user-friendly format that makes it easy to locate the exact product a user is looking for depending on their requirements. All camera outputs and pertinent specifications have been included in a highly organized format for the users’ convenience. Visit Imperx at SPIE DCS 2018 at the Gaylord Palms Resort and Convention Center in Orlando, FL at BOOTH 1405 and trust us help you find the perfect camera for your needs. See you soon! To see a .pdf version of this document, go here.